Programming is the language of the future, as well as the key to a world of limitless job opportunities. 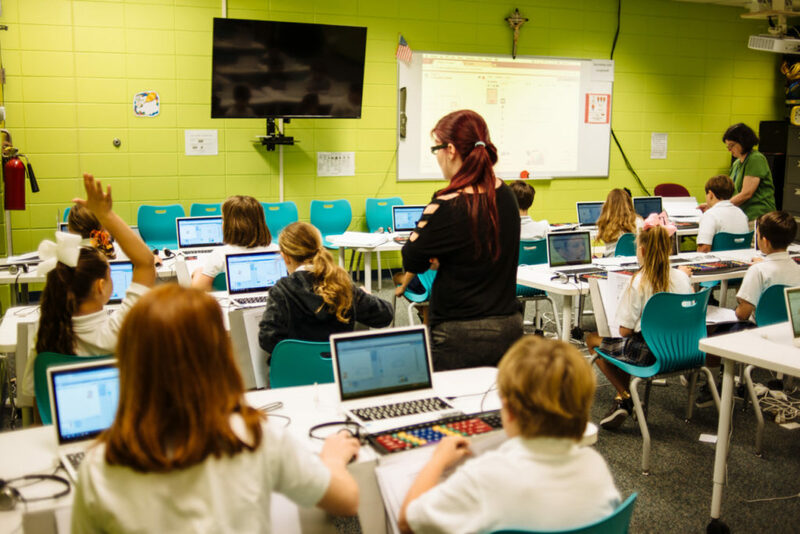 OLF Elementary is preparing their students for the future by offering a visual programming course, “Scratch” for third grade through six grade students. Scratch is a visual programming language from MIT Media Lab. In the computer lab, students are able to program their own stories, games, and 2D animations along with sharing their creations on the web. Sandy Davis, OLF’s programming course instructor truly believes in the power of Scratch. “From a developer’s perspective, Scratch is a great way to introduce students to the programming world,” said Davis. Cindy Hahn, OLF’s principal, believes in giving their students as many “tools” in their “toolbox” to prepare them for higher education, but most importantly for life. “In the rapidly changing world of technology, we must begin preparing students early in life to use and be comfortable with technology”. OLF Elementary believes in building well rounded students and puts emphasis in new learning. The technology department is led by Ms. Celeste Lousteau. Ms. Lousteau teaches the fundaments of using the computer along with keyboarding to all the students at OLF Elementary.